Like the Bob Dylan song, there is a “change is coming on” in sports physiology and it is the ultrarunning community showing the way. A small but growing group of ultrarunners have been actively pursuing the fat-adapted approach with success, including some of the elite athletes, most notably Zach Bitter, Jon Olsen and Nikki Kimball. Fat-adaptation involves sharp carbohydrate restriction in conjunction with a complementing increase in fat consumption (with many of those fats being saturated fats) to induce the physiological shift necessary for the body to “switch” to burning “fat as fuel” at much higher rates. In conjunction with the dietary shift specific training, both in low and high intensity is programmed into the training blocks to push the fat burning envelope into higher intensity levels. Observationally, athletes following this approach have been able to complete ultramarathon distances on a fraction of the caloric intake normally necessary, many athletes report completing 100 Mile runs on 1300-2000 calories. Unfortunately, there is scant science to support the plausibility of such a dramatic drop in consumption. That is, until now. Last year Dr. Jeff Volek RD/PhD, his graduate students and colleagues commenced data collection for the FASTER Study (FASTER=Fat-Adapted-Substrate oxidation in-Trained-Elite-Runners) to look at the physiological differences between elite male ultra-marathon runners with one cohort following a conventional high carbohydrate diet and the other following a low carb/fat-adapted strategy. While the publications won’t be emerging into the Journals until later in 2015 some of the basic metabolic data has been presented by Dr. Volek at various nutrition and sports physiology conferences which I can share. As you can see from the chart, these two cohorts, High Carb Conventional Diet & Low Carb Fat-Adapted Diet, were very well matched. The chart below represents the macronutrient profile of the two cohorts. As you can see from the pie charts the conventional diet follows what most athletes are advised to consume while the Low-Carb cohort has a very high fat intake. Keep in mind this is as a percentage of calories and because fats are over twice as calorically dense and very satiating when fat is consumed in a carbohydrate restricted diet an athlete simply does not eat much and tends not to overeat so the idea many people imagine of a high fat diet does not fit the reality of how it is practiced daily. Also note many of these athletes do cycle in concentrated forms of carbohydrates and supplements for races and high intensity blocks of training, however, to control variables for the study, their diet was restricted to a Low-Carb protocol. Fat utilization: The current science says the absolute maximum amount of fat an athlete can burn is upwards of 1.0 grams/minute with most highly trained athletes falling into the 0-45-0.75 grams/minute range (Venables et.al. ; “Determinants of fat oxidation during exercise in healthy men and women: a cross-sectional study”), .41 grams/minute in moderate performance athletes and .27 grams/minute in low performance athletes (Lima-Silva et. al. ; “Relationship between training status and maximal fat oxidation rate”). The chart below depicts the data taken from the Venables study. FASTER: The chart below from FASTER shows the data points of the two cohorts. As you can see the high carb cohort fat oxidation rate data is consistent with the Venables data, thus is consistent with the existing body of science. 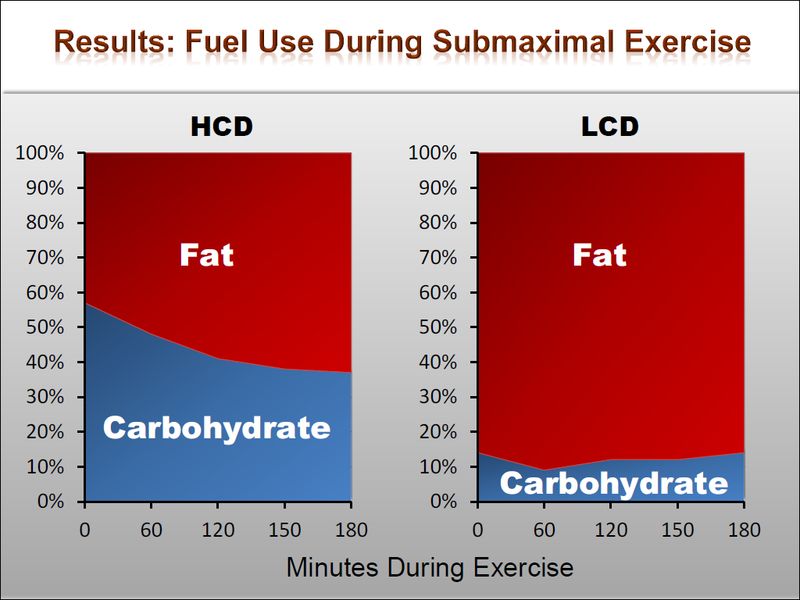 Examining the data points between the two charts it is evident the high carb cohort of FASTER were actually on the upper level of conventional fat oxidation capability. On the other hand the low-carb/fat-adapted cohort was on a completely different level. The mean fatty acid oxidation rate was OVER twice the rate of the high carbohydrate cohort and the lowest rate of fat oxidation in a subject being 1.1 grams/minute which is higher than what the current published literature suggests is possible with one subject actually recording a rate of 1.8 grams /minute of fatty acid oxidation! The Crossover Point: The Crossover Point Hypothesis was developed and studied by George Brooks et.al. at UC Berkeley and it basically measured where an athlete would “Cross-over” from burning primarily fat to primarily carbohydrates for exercise. This investigation established that athletes, depending upon level of aerobic training, “crossover” between 35-65% of their VO2Max. As you can see from the graph, the high-carb cohort data falls consistently in line with the current published literature, but, with the low-carb cohort, not only does the fat utilization shift into the realm of higher aerobic intensity (the realm which is regarded as the “sweet spot” for endurance athlete performance) it does so at a much higher rate of fat utilization. The final chart depicts the mean fuel partitioning of the subjects over a 3 hour submaximal treadmill run at 65% of VO2Max. While both cohorts were burning more fat than carbohydrates by the end of the 3 hours, the low-carb subjects are burning approximately 30% more fat and, consequently 30% less carbohydrate than the high-carb subject. These charts and graphs provide a strong visual of the significance such a shift can have for the ultra-endurance athlete, particularly for the athlete who is experiencing fueling/energy and/or gastrointestinal issues while other athletes do quite well on a conventional high carb diet for athletes. Remember, in the real world, every athlete is different and you are your own N=1. For the athlete who is already experiencing the benefits of a “fat-adaptation” this article can serve to show your skeptical friends and family it is not anecdotal, that you really are not lying about how little you need to consume during training/competition and there is real science behind the approach. While there is a lot more esoteric scientific data that will emerge from FASTER, these easy to understand examples pretty well demonstrate a seismic shift is coming and a complete rethinking of how to perform will emerge. Finally, a special thanks to the subjects who allowed themselves to be poked, prodded, biopsied, and, probably worst of all, subject to a 3 hour treadmill staring at a concrete wall in the name of furthering science. The feedback I have received from Dr. Volek and his staff are all the subjects were great to work with which reflects on our community. Excellent. I’ve been consuming a high-fat, low-carb diet for three months now. I’ve noticed more energy, less hunger before/after workouts, and better sleep. It would have been interesting to have included “normal” people who are ultra runners in the study. I am 6’2″, 220lb and am sure that my fat % is likely around 30%. I would love to lose a bunch of weight and will try to follow what is here, but not being included in the study may skew things. I’m “normal” Tim, in that I am only a half-marathon runner and personal trainer. I thoroughly recommend a low-carb diet (keto generally works better for me) both for performance and fat loss. The caveat is that you have to learn what you are doing; nutrient density becomes even more important. It is not enough to simply stop eating carbs; you need to look at the best quality sources of fats and proteins as well. Some general guidelines are to eat grass-fed/grass finished meats, wild caught fatty fish, grass-fed butters (Kerrygold is good) and clarified butters such as ghee. Coconut oils are invaluable as a source of MCT and also a better choice to cook with. Start cherry-picking from Dave Asprey, Volek and Phinney, Mark Sissons, Johnny Bowden, Jack Kruse, Jimmy Moore and, particularly for fasted-training fat adaptations, Barry Murray. They all offer great advice but remember, n=1. If it works for you then stick with it (dependent on your blood labs) and if it doesn’t then throw it out. I have spent ten months becoming fat adapted (with only a couple of blips) and I feel better for it, but then I don’t do ultras like you crazy bastards. Interesting. I heard Louise Burke speak at ACSM in 2014 and she indicated their labs had been trying to show fat adaptation for years and had never been able to produce the data. I’ll be interested to see the full vetted results in peer-reviewed journals. It is working well for me, being a ‘normal’ kind of old, slow guy I switched to very low carb and have been able to complete my training runs on very low carbs during the run, for example over the last approximately 6 weeks I ran 26,28,30, and 32 miles taking only 300 calories of CLIP2 (not sure how the calories break down in CLIP, it is not all carbs) and some Vespa with me and then 35 miles with 450 calories (I kind of pigged out at the end and could have not consumed all of it.) GI tract more comfortable, energy levels more stable, when not running I can skip meals with very little discomfort, and I lost weight I had not been able to lose for several years. Plus I get cream in my coffee and eat a lot more brie, this diet was not hard to get into after a few weeks of adjustment. what are some resources for this type of diet planning? What does one eat prior to and after workouts…and during competition? I read Zach Bitter’s blog, and read “The Art and Science of Low Carbohydrate” and “The Art and Science of Low Carbohydrate Performance ” by Phinney and Volek, then just went from there. It’s pretty straightforward from there. The problem here the HCD subject is not really HCD, so the whole thing is biased. 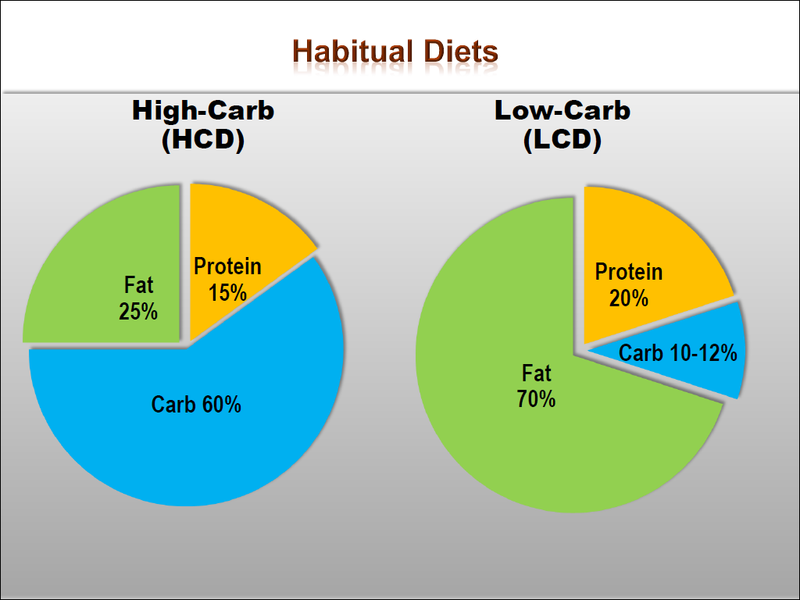 A true HCD diet is 80% carbs. What kind of food did the HCD subject eat? Balanced portions like I am sure the LCD subject did? This is scientifically interesting – the degree to which the human body adapts metabolism. There are also several short term studies showing efficacy for weight loss of a LCD. But apart from having to eat less during the race, what’s the advantage? Many studies show better athletic performance with carbohydrate fueling. The higher the exercise intensity the more it matters, so for ultrarunning it may not matter much but there’s no objectively demonstrated benefit. More importantly there is lots of epidemiologic evidence correlating everything from heart disease to dementia and neurodegenerative disorders to high fat and animal protein intake in a way that makes a typical LCD more likely to be harmful than helpful. Eating fat does not make you fat. Insulin sensitivity makes you fat. And ill.
High fat diets have, time and again, been shown to improve bio markers for health. eg, watch “Cereal Killers” movie for an example of this. While this article makes ketogenic dieting sound wonderful, be aware that there are issues. First, it doesn’t work for everyone. Take a look at Volek’s cycling study. Only one, out of the five participants, saw a significant performance increase. Second, about 25% of the population will see their blood triglycerides skyrocket into the nightmare zone on a VLC/keto diet. So be careful out there. I’m going to be really interested in reading the actual study, rather than context-free charts provided by a guy selling product into that market. I’m wondering about selection bias – how did they choose their cohorts? In other words, did they compare a group that tried VLC with some success against another group that ate higher carb(and may or may not have tried VLC without success)? I’m really curious. Can’t wait for publication. You say that you “tried it” without success, but that doesn’t tell us anything. Ketotic != Fat Adapted. Becoming a good fat burner requires a much longer term commitment than just achieving nutritional ketosis, as your body has to make physiological adaptations to lipoysis and fatty acid conversion. It’s not just about checking your ketones strips. Seemed like six months was a long enough test … and agreed about fat-adapting being different from keto adapting. I manage to fat adapt just fine without any ketosis other than the ordinary overnight variety. BTW ketostix are not useful because your body quits excreting ketones as it fully keto adapts. Testing your blood ketone level is the only way to know for sure if you’re in real, full-time ketosis. A couple of detail points. The Peak Fat Burning chart isn’t ‘During VO2max’ as stated in the title, it’s around 50% and 70% VO2max according to your subsequent graph. Also, there appears to be an error in the scale of the Fat Oxidation Rate graph, as it shows peaks of around 0.55 and 1.2 for the two cohorts which 20% lower than shown in the Peak Fat Burning chart. Also, where are the data points or error bars on the Fat Oxidation Rate graph? As it stands, that’s just a schematic diagram rather than a scientific result. 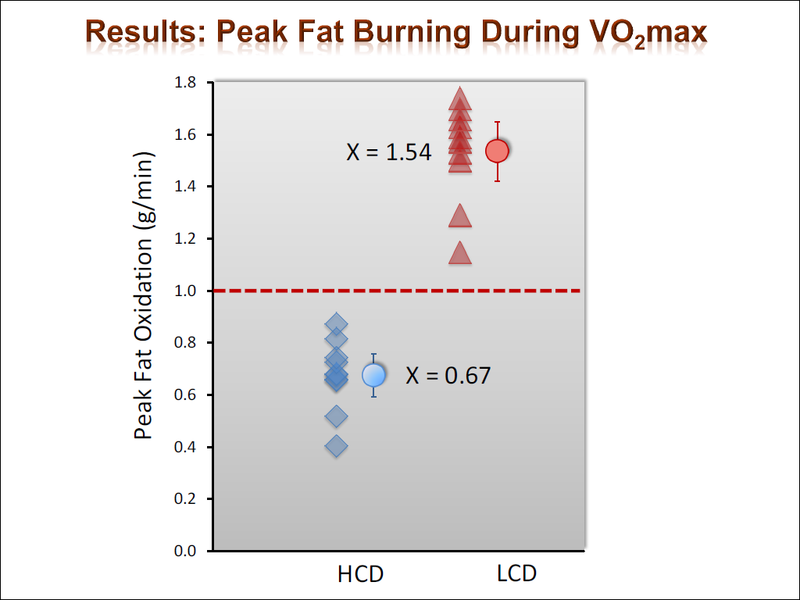 Interestingly it shows a narrower peak for the LCD cohort due to the steep fall-off at high percentage VO2max. Your comment about science is right on. There’s so much we don’t know about the human body, it’s staggering. This is yet another example of where science will spend decades trying to explain what’s been found empirically. We certainly don’t know enough now, and anyone who says we do is full of it. Individual testing is the answer, just be aware that there are dangers to watch out for. Another that I didn’t mention is the effect of a ketogenic diet on the gut biome – antibiotics aren’t the only thing that can damage it. I know one ultrarunner who damaged his with a KD. He was fragile from previous antibiotic treatments, but still … he really hammered himself. I know another who’s blood triglycerides jumped up into the 500 range … so like I said, be careful out there. It may be a silver bullet for someone else, but it might just be a bullet for you … so watch it when you pull the trigger. I am curious about whether similar results (increased fat oxidation) could be achieved with a higher carb intake BUT with completing the vast majority of training in a fasted state. So for example, a Macro of 50% carbs, 15% protein, 35% fats. Runner eats last meal of the day at supper night before (say 6PM). Runner wakes up the next morning, skips breakfast, and completes workout in a fully fasted state. After workout, recovery starts, and a typical mean (with the 50/15/35 above) is consumed. Dr. Maffetone, do you know of any research that has been done around this. Running fasted for fat adaptation vs. a LCD? any updates in the past year? Not logically possible to get worse performance from a fuel that supplies more ATP to the TCA cycle. Given that we have not even identified (nor understand the functions of) all of the 1,100 or so proteins in mitochondria and that, as a result, we do not fully understand the nature of the complex processes taking place within mitochondria, it seems a bit premature to make any athletic performance connection with diet without at least an operative mechanism. Does fat adaption actually occur or do certain individuals have genetically derived enzymatic profiles that are more optimized for fat consumption and efficient energy production (ATP)? Looking at the very diverse diets throughout the ages would suggest that there are sub-populations that will have evolved with food sources dominated by one or another macronutrient (e.g. fatty meat for arctic dwellers) and therefore potential for an evolved ability to efficiently produce energy on such a diet. Without a mechanism and detailed information about the chemical make-up of the mitochondrial cells in the individual being studied, much of what is being presented is just correlation, not causation. Take it as such. That’s a lot of hand waving without offering a null hypothesis. As soon as the TCA cycle, glycolysis, beta oxidation was understood, and that fat supplies more ATP than glucose, Nature preferring fat had to be the default null hypothesis. Carbo-loading should have been the hypothesis that had to be proven against the null, not the other way around. 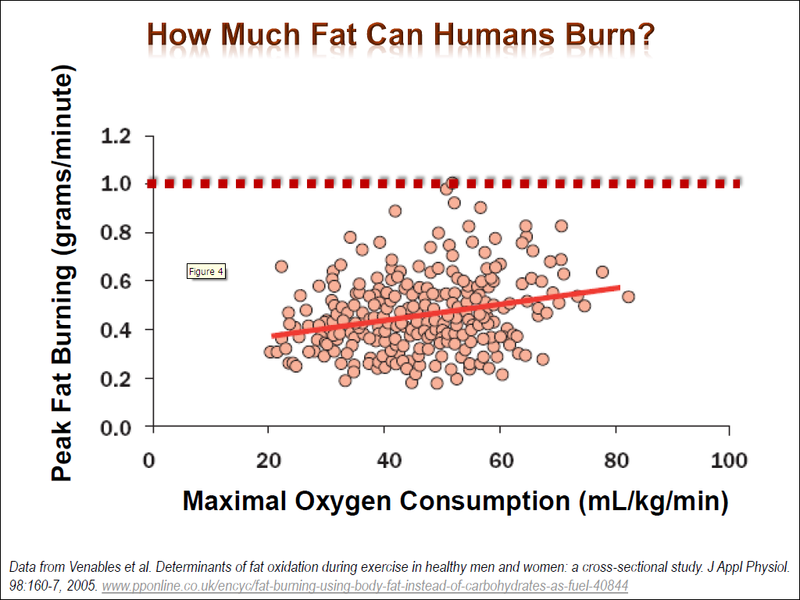 The question should have been, not whether some people are more optimized for fat burning than others as you propose, but rather why some people aren’t capable of using a superior aerobic fuel? And, what would be the selection pressure for an organism that couldn’t effectively utilize a better fuel? Nature would have optimize on the better fuel whenever possible; this is what natural selection tells us. Wesley, I’d like to talk to you more about your race. How can I contact you? This is interesting stuff, but I worry about the long term affects of HFLC dieting- mostly the LC part. There is likely a link between Overtraining Syndrome and chronic glycogen depletion and an association between OTS and a low carb diet. Anecdotally, a few of the athletes who were subjects in the FASTER study have since seen marked performance decline consistent with OTS. As with most things, I don’t think either extreme is correct. Best to consume a moderate diet (40-60%CHO, 40-60% fat, 15-20ish% protein) then utilize training methods to improve fat burning- training selectively in a fasted/glycogen depleted state and ensuring that the overwhelming majority of your training is performed at an intensity low enough to allow for fat metabolism instead of being reliant on carbohydrate. I’m not sure I understand how to interpret this. Does “oxidizing fat” mean using fat from the body? Or from the food that was recently consumed? If it’s just the food that was consumed I’m not sure what this proves….of course the body will use the fuel that’s available to it during exercise. If that fuel happens to be fat, why, then it will burn more fat! Right? If you take one of the HCD athletes, switch his diet for a day or two, and then test him will he show up as “fat adapted”? If you give a fat adapted athlete some carbs and test him, will he look like a regular old HCD athlete? 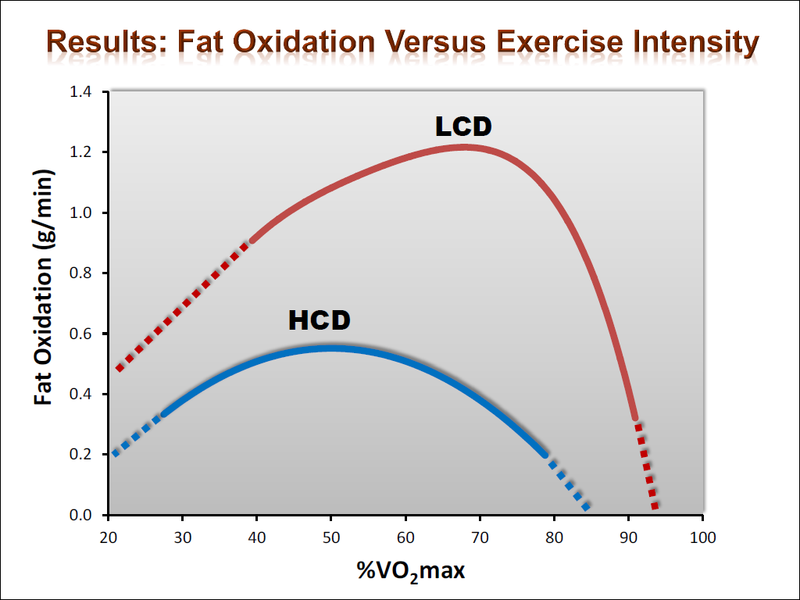 Along the same lines, the author points out enthusiastically fat use peaks at a higher % of VO2 max for the LCD group. But who cares? Again, if that just means they’re using the food they consumed, which happens to be fat, why should we be surprised? Is there any evidence in this data that it’s as EFFECTIVE for athletic performance? Or weight loss? Or anything? 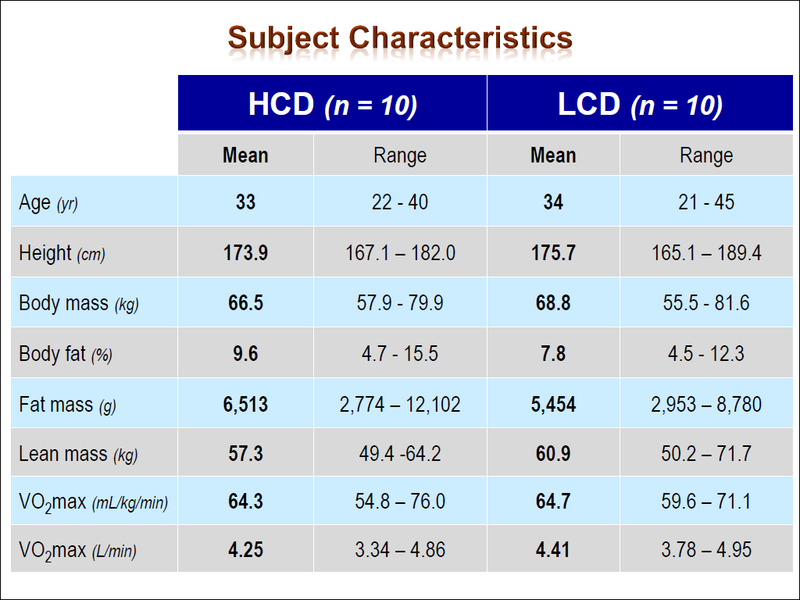 Hoping there is some good news in this data since I’m currently eating LCD, but i don’t get it. The evidence indicates that eating more fat helps you oxidise more fat for fuel, but that it is indeed the fat that you eat. The hypothesis is that in time, metabolic adaptations take place which mean that the body starts to produce more glycogen from internal mechanisms while utilising body fat for lower intensity work. It’s not as simple as going very low carb for 5 days, the adaptations take at least six months and, in many cases longer. It is, however, possible to achieve said adaptations without being on a strict ketogenic protocol. We can still consume carbohydrates and, in some cases as high as 150g a day and STILL produce ketones. However, ketosis shouldn’t be the main aim, but fat adaptation or, metabolic flexibility. Metabolic flexibility is the ability to shift from one energy pathway to the next without the need for wholesale restriction of any food group. However, we are all biochemically different and some people adapt very well to a very low carb diet while many don’t. So my advice would always be to experiment and find what works best for you. Just curious, have you tried the new supplement Keto O/S? I can’t believe how amazing I feel and the mental clarity! I find these results interesting and I’m happy to let agenda-toting nutrition researchers fight it out among themselves. I’d love to read the study but it appears that it’s behind a paywall. Too bad. As far as the “seismic shift” in principles of sports nutrition or exercise physiology that the author anticipates…I have my doubts. I kept asking myself what the benefit of all this is, and I have no clear answers…and certainly nothing that would justify the health risks of a diet comprised of 70% fat. This “N” will stick to what he knows to promote good health and superior athletic performance. Research the health risk of oxidizing high amount of glucose. Fat burns very clean. Quality fat intake combined with lower amount of high quality carbs has less metabolic impact. Less oxidation stress. Fat is not the real culprit of cardio vascular disease and weight problems. Sugar/high carbs are the culprit. The major benefit for endurance athlete. Fat fuel tank = very large. Glucose fuel tank = small. There are many other benefits. Best book about it: the art and science of low carb living and the art and science of low carbs performance. Phinney & Volek. They both are. Did you not think that possible? Simple sugars and fats like the ones found in animal products, processed oils, and coconut are positively associated with obesity and atherosclerotic lesions. The SAD is full to the brim with these things. Other fats, like the ones found in olives, avocados, nuts and seeds are cardio protective. So are complex carbohydrates like those found in fruits and vegetables – even those some consider “high carb”. You state “the health risks of a diet comprised of 70% fat” like it’s a given fact. It’s not like you think. Because it is a fact that there are health risks associated with high fat diets. There are risks, like metabolism and/or gut issues, but a balanced LCD addresses that. Are there other risks you know of? I had a friend that was in a study like this and his Cholesterol levels drastically improved. Thus this low carb. diet is much more healthy. The current beleif in what is healthy is all wrong, thus all the heart problems in this country. I have a PhD in Biochemistry, let me make this simply, if your going to be a top 10 ultra running in the world, you need to be on this diet. You can’t conclude that based on what happened to your friend, and you couldn’t conclude that if it were n=1000. The cholesterol improved? From what to what? Someone eating the SAD with a cholesterol of 250 could probably clean it up substantially by switching to HFLC, which by the way has been shown in some studies to raise total cholesterol. Are you going to bet your life or health that an increase in the theoretically neutral large-fluffy LDL and a decrease in the “bad” small-dense LDL confers a health benefit that outweighs the known risks of increasing LDL cholesterol overall? You have a PhD in biochemistry but use anecdotes and assertions not in evidence to make a point? I hope you aren’t doing that on my account. I never use anecdotes because they prove nothing, but I can counter your anecdote with one of my own. I eat a whole food plant based vegan diet that is very low in fat – no added fats, few nuts. My cholesterol is 147, down from an around 200 on a Mediterranean style diet. So we have someone who lowered their cholesterol on a HFLC diet and someone who lowered their cholesterol on a HCLF diet. I think this means there is a lot we don’t know. We do know, however, that high fat diets are positively correlated with atherosclerosis, for example, and we know HCLF diets can reverse heart disease while HFLC diets do not. If the “new paradigm” is destroying artery health, for example, for performance gains – and I think the jury is very much out on whether there are performance gains – then I want no part of it. I very much doubt that we are going to suddenly “discover” after many millennia that to compete at the top of any sport requires eating HFLC. That defies common sense and would require much more than a few already top runners winning events on HFLC. As soon as you typed “vegan” you were immediately penalized and moved to the back of the class with Campbell, et.al. Peter, is there any analysis of / comparison between the heart rate data of the two groups?